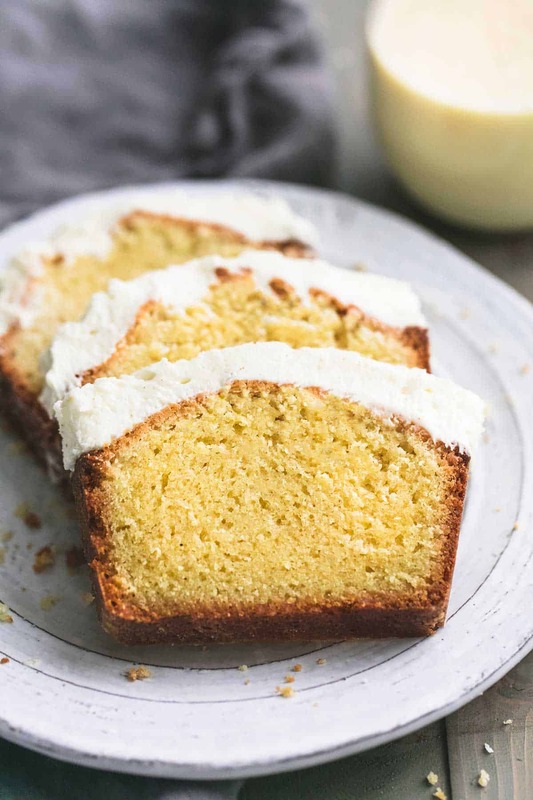 Easy eggnog pound cake piled high with a thick layer of sweet, rich, eggnog frosting is the perfect holiday breakfast or dessert treat. Tis the season for holiday baking!! I have been baking like a mad woman lately which means my house smells like holiday heaven nearly 24/7 and I and 100 percent okay with that. I realized that this year Thanksgiving fell on the earliest possible day of November which means Christmas season started earlier than usual. My tree went up earlier, the stockings went up earlier, the shopping started earlier (yayyyyyyyyy to get that done sooner than normal) and I feel like I got a whole extra week of Christmas this year. 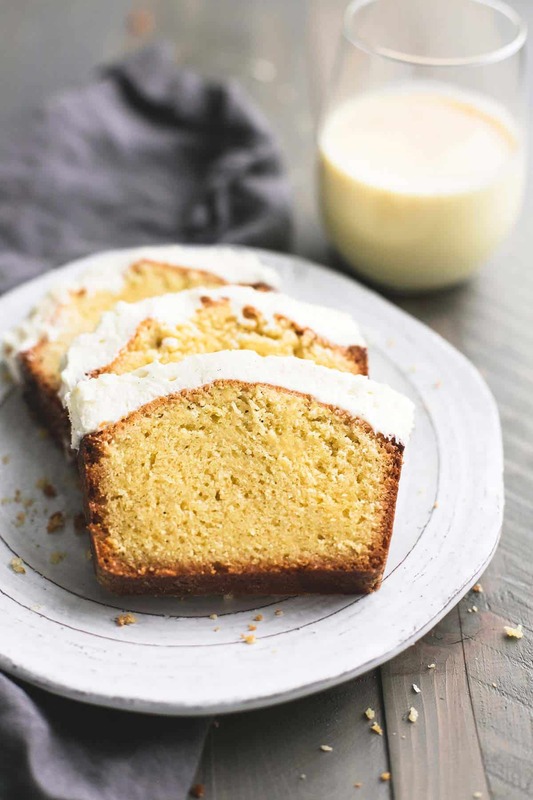 This eggnog poundcake is perfect for the holidays. It’s light, and not too dense, but still has that classic poundcake sink-your-teeth-into texture you want. 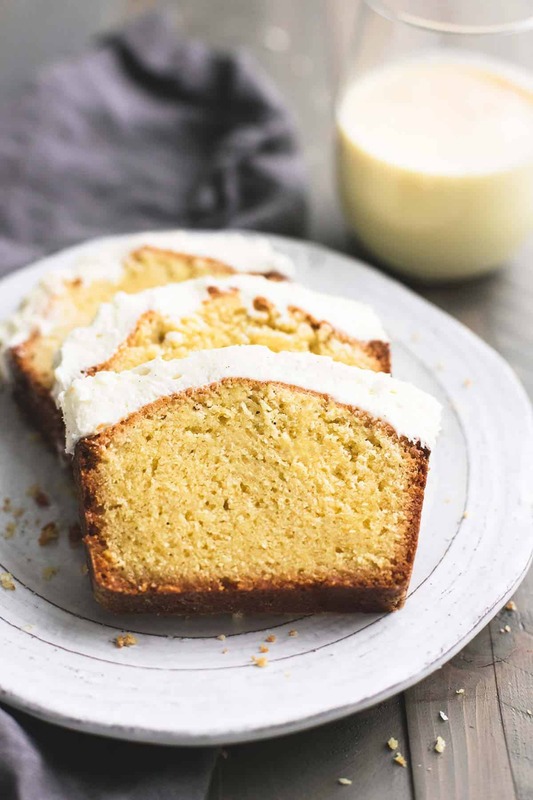 The cake and frosting themselves each have a mild eggnog flavor so when you pair them together you don’t overwhelmed by the eggnog-i-ness of it all. 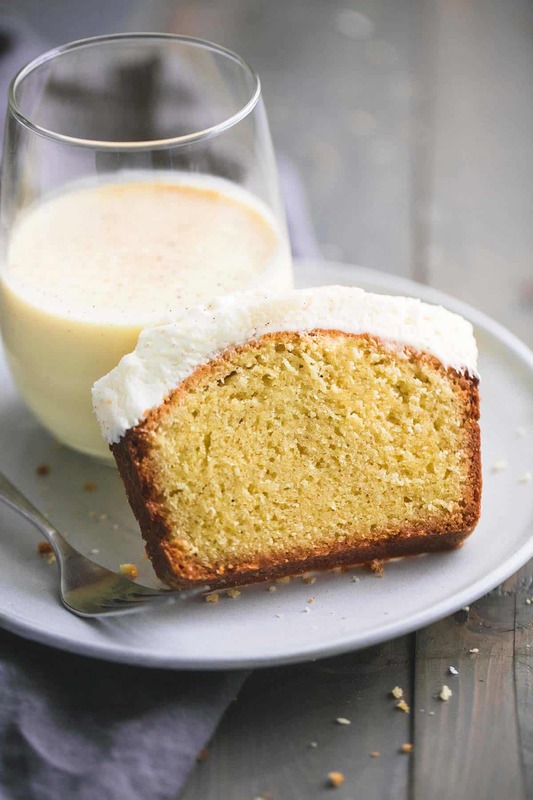 Even if you aren’t normally a fan of straight up eggnog (which I am not by the way) you need to try eggnog in poundcake form. I usually shy away from a glass of eggnog but in baked goods it’s one of my favorite holiday flavors! In a large bowl cream together butter and sugar until very light and fluffy (2-3 minutes with an electric mixer). Add eggs, one at a time, mixing after each until incorporated. Mix in vanilla and nutmeg. Alternate mixing in flour and milk until both are incorporated (do not overmix). Spread batter evenly in prepared pans. Bake for 55-70 minutes until a toothpick inserted in the center comes out mostly clean (a few crumbs are okay but no wet batter). Allow to cool completely before frosting the cake. To prepare the frosting, cream butter for 2-3 minutes until very light and fluffy. Mix in powdered sugar. Add eggnog 1 tablespoon at a time until frosting is smooth and spreadable (but not runny). Stir in nutmeg. Spread frosting on cooled pound cakes. Cut into slices and serve or store in airtight container up to 3 days. Try these other Eggnog Recipes you'll love! Yummm,,,hope I can still find some Eggnog for this and a few of the other Eggnog recipes!